Dec 11th. Sue Brown and Lorraine Irwing. It is by way of an early Christmas treat that we have this talented duo from Oxford. 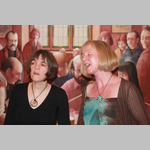 Expect skilful harmony singing from their well crafted repertoire that is firmly rooted in the tradition. They have a knack of finding different versions of songs that we know and love. Sue and Lorraine are firm favourites with our audience and the joy they have in performing shines through. I am looking forward to hearing a few seasonal items in their sets.